I write to share with you one of my tiny joys of late fall. I took this photograph during the first week of November. What is it? A twig with some leaves, right? Look again. What are those yellow stringy things hanging from the twig? Spiders? Whiskers? Look closely. These are the bright yellow petals of the witch hazel flowers. Think about it: flowers blooming in November! Every fall when most of the leaves have dropped from the trees and the sun is weak I look for these cheery little flowers on the witch hazels. They bring a bit of warmth to the cold dark days when I seem to need it most. Tiny joy, indeed. Witch hazel (Hamamelis virginiana) is a tall shrub that grows in the oak and maple forests of northeastern Iowa. It is easily killed by fires and logging so it grows only in few protected locations. The shrubs blend into the background for most of the year, but in the late fall they offer a bit of sunshine to those who take the time to notice. 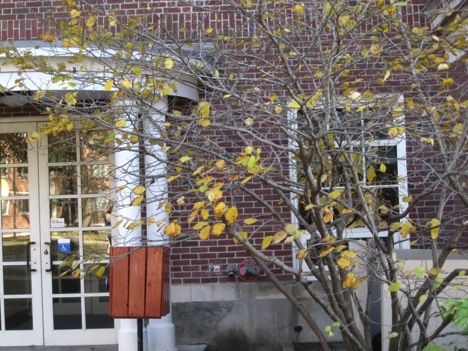 Lucky for us, there are several witch hazels on Luther’s campus, including one tucked into the entry way on the north side of Koren and a few sharing a little patch of real estate with several other native trees and shrubs near the loading dock of Olin. The leaves will soon be gone and it will be even easier to see the bright flowers among the gray branches. This year the one near Koren doesn’t have many flowers. I’ll leave you the tiny joy of finding the ones behind Olin and others growing in undisclosed locations around campus. Once you have found these shrubs with their odd little flowers full of pollen and nectar, perhaps you will wonder, as I do, why they wait until late fall to bloom. Most plants growing in the shady, dark hardwood forests flower in the early spring when there is lots of sunlight and pollinators are easy to lure to the flowers. Other species flower later into the summer when the canopy has filled in. But, none, aside from the witch hazel waits to bloom until temperatures have dipped below freezing and winter winds come creeping around. Why do they do this? Ha! I’ve tricked you into playing science with me. Biologists notice patterns: plants flower in the spring and summer, not in the winter. Then we make up explanations and hypotheses for these patterns. Plants bear their showy flowers in the spring and summer because that is when they are likely to be pollinated by insects that will transfer pollen between plants (allowing for sexual reproduction) in exchange for a nectar reward. The exceptions to the patterns, like the fall-blooming witch hazel, force us to reexamine our explanations. 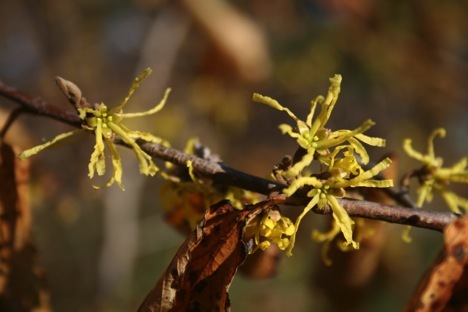 Botanists who have studied the reproductive biology of witch hazel have learned that to produce seeds the flowers must be visited by pollinators, including flies and small bees, but mostly fungus gnats (Anderson & Hill 2002). Only a small percentage of the flowers receive enough pollen to produce seeds. A potential clue to its out of sync flowering schedule may come from the forests farther east where there are two species of Hamamelis. One of them, Hamamelis vernalis, flowers in the early spring (as its Latin name suggests). 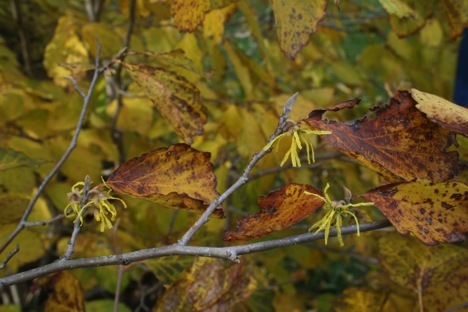 It has been suggested that "our" witch hazel, Hamamelis virginiana, has evolved to flower in the fall to avoid competing for pollinators with its close relative (Shoemaker 1905). By flowering in the late fall when nothing else is blooming, it receives the exclusive services of whatever fungus gnats happen to be in the neighborhood. If you haven't had enough witch hazel joy yet, take one more look at the plant. In addition to flowers, you should be able to find ripe fruits from last year’s flowers. (That’s right, it will take one full year for the flowers that you see now to produce mature fruits.) 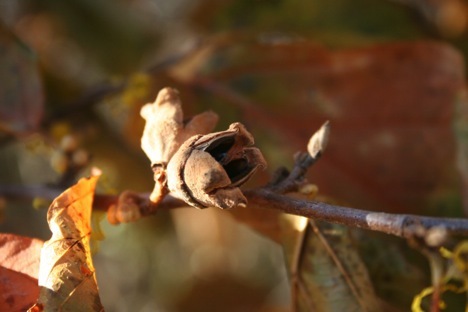 The fruits are little brown capsules (smaller than an acorn) that split open to reveal shiny black seeds inside. The smooth, vaguely banana-shaped seeds are slowly squeezed out of the fruit as it dries, landing up to 20 feet from the parent. The lucky ones will escape predation, remain dormant through two long cold winters, and finally germinate and grow into new witch hazel plants bearing tiny joy for all who take the time to look. Beth Lynch, associate professor of biology, is dedicated to protecting and restoring the ecological heritage of northeastern Iowa. 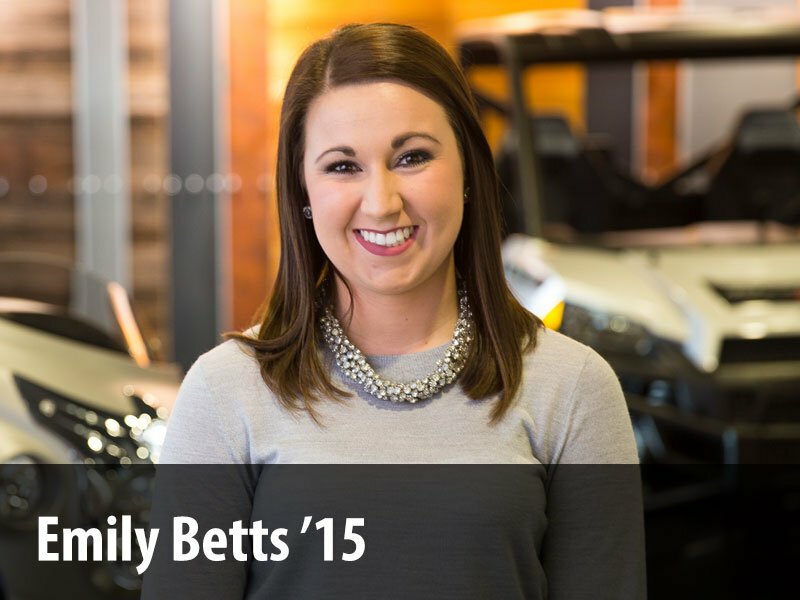 When not in the classroom, she is working on land stewardship projects at Luther, in Decorah city parks, state and county preserves, and at Seed Savers Exchange Heritage Farm. She recently received an Iowa College Foundation R.J. McElroy grant to study the impact of Mid-Holocene climate on fire regimes on a sand plain in northern Wisconsin, and in the past 10 years has received two National Science Foundation (multi-year) grants to research the effect of landscape context on the sensitivity of vegetation to climate change, and fire and vegetation heterogeneity in time and space. This is so exciting! Russ and I have seen these flowers this fall. I think it was in the wooded area along the Vernon Springs bike trail near Cresco. I did not know what it was! Lucky you! Aren't they fun? Do the campus witch hazels have noticeable scent? THank you for the article. I will be looking for the campus trees.